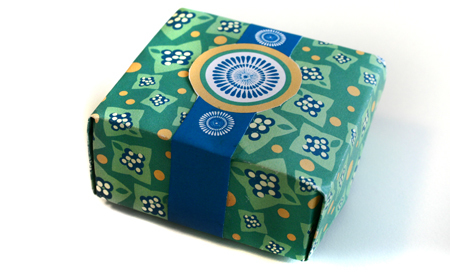 “Brazilian” Small Gift/Favor Box: Blue, Green and Gold | Print, Cut, Paste, Craft! For this pattern I chose a color palette inspired by the Brazilian Flag: blue, gold and green. It’s a great vibrant tropical theme that could be used to wrap a small present both for men and women alike. Click here to download the free printable PDF file to build your box. The file contains 2 different ribbons: choose your favorite! To read the instructions on how to build an origami box go to our “How to” section or click here.